The harness is one of the essential pieces of equipment for kiteboarding. Comfort and quality are the most important features of your harness since you’ll be wearing your harness every time you kite. Don’t skimp on your harness. Harnesses come in waist, seat, or boardshort varieties and we carry Dakine, Mystic, Slingshot, Naish, Prolimit, Ride Engine brands and more. Seat harnesses have leg straps that stop the harness from riding up which is great for beginners. The lower hook point and center of gravity also makes a seat harness an excellent choice if you have back problems or want to sit down against the power of the kite rather than lean back like you would with a waist harness. 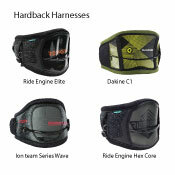 Dakine has proven to be the leading seat harness manufacturer. Boardshort harnesses are exactly what they sound like, kite harnesses designed to wear like your favorite boardshorts. Boardshort harness design is very similar to the seat harness with neoprene padded internal leg straps to keep them from riding up and provide a lower hook point for a lower center of gravity. 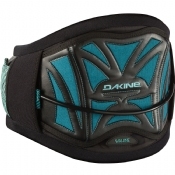 Dakine makes the most popular and comfortable boardshort harness. Women’s harnesses are strong enough for man, but specifically designed to fit a woman's body. They are contoured and shaped differently from a men’s harness to fit the curves of a woman with padding and reinforcements in different places than a men’s harness. 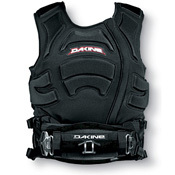 We carry both women's seat and waist harnesses from Dakine and Liquid Force. Impact harnesses are a combination of an impact vest and harness for the best of both worlds. Protect your torso from impact and stay connected to your kite at the same time. The harness spreader bar is integrated with the impact vest rather than being two separate pieces where you would typically have to fit your harness over your impact vest. We carry anything you can think of to add onto your kiteboarding harness: Leashes, spreader bars, harness clips, spreader bar pads, hook knives, lock tubes, and more. 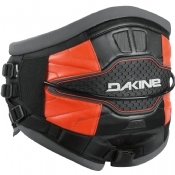 From the leading manufacturers like Dakine, PKS, Slingshot, Ride Engine, and Naish. 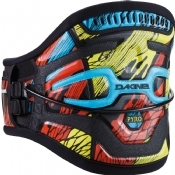 Kiteboarding Harnesses for a fraction of the price.